The Department of Homeland Security released its weekly “Declined Detainer Outcome Report,” which shines a spotlight on sanctuary cities where local police have released illegal immigrants even though federal authorities requested that they be detained until Immigration and Customs Enforcement agents can come get them. The latest report, which covers February 4-10, shows that contrary to the myth sanctuary city proponents peddle—that those released are nonviolent—dozens who were released have been convicted of violent crimes, such as sexual assault, domestic battery, and cruelty toward children. In total, ICE issued 2,825 detainer requests across the U.S. and 47 were declined. Although cities and counties in New York and California accounted for nearly half of the refusals, communities in Colorado, Florida, Massachusetts, Minnesota, New Mexico, Texas, Virginia, Washington and the District of Columbia also made the list. The new report also highlights jurisdictions that have recently declared themselves sanctuary cities. 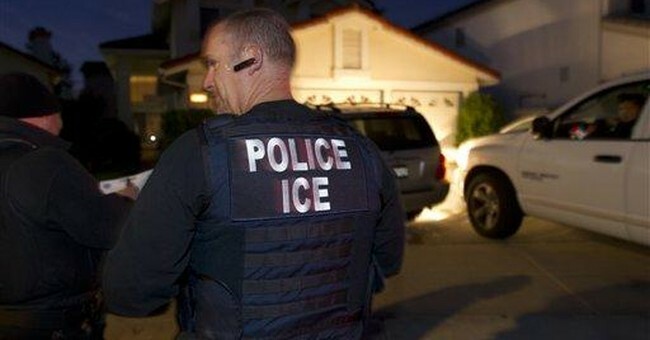 Since January, Baltimore, Tulare, Calif.; Ithaca, N.Y.; Travis County, Texas; Iowa City, Iowa; and Boulder, Colo., have publicly announced their intentions to not honor ICE detainers. The report noted that ICE field offices have been instructed to continue issuing detainers on all removable aliens in law enforcement custody regardless of prior non-cooperation. As a result, the report states, the number of issued detainers will increase over the next several reporting periods. The report comes days after Attorney General Jeff Sessions threatened to pull federal funding from cities that refuse to comply with federal immigration law. “Such policies cannot continue," he said Monday. "They make our nation less safe by putting dangerous criminals back on the street."